On a cool Saturday night nearly a year ago, a mixed group of wine and beer fans was invited to a gracious Craftsman-style home in San Diego’s tree-shaded Mission Hills neighborhood. The guests gathered around the dining room table, which was crowded with 750-mL bottles and pint glasses, all in 11 neat clusters. The hosts, Tom and Susan Brown, often enjoy beer with their meals. But this was more than a casual drinking session. Instead, this was a vertical tasting, a tour of 11 aged beers from the Vertical Epic series of Escondido’s Stone Brewing Co. The junior beer on the table was a year old; the senior, a venerable 12. All were sampled, discussed and judged. Take, for instance, the Stone Vertical Epic 10.10.10, a Belgian-style tripel brewed with muscat, gewürztraminer and sauvignon blanc grapes. When this 2010 beer was fresh, Tom said, the fruit overwhelmed the malts and subtle spices. Wine fans would liken it to a Beaujolais nouveau, bursting with off-the-vine flavors. A custom borrowed from the wine world, a vertical tasting is usually devoted to a series of beers from different vintages but the same style. The Browns’ session was unusual—each beer in the Stone Vertical Epic series, while sharing some qualities, represents a unique style. Vertical beer tastings of any sort, though, are a relatively recent phenomenon. When mass-produced lagers dominated the American market, aging was not recommended—these beers were meant to be consumed as soon as possible. But breweries now make deep, rich, complex beers, and some are sturdy enough to be aged. If carefully selected and treated well, these beers acquire unexpected nuances and power with time. Even so, such beers are rare. How do you find these gems? One way: trial and error. In his new book, Vintage Beer (Storey Publishing, $14.95), Patrick Dawson noted that his introduction to aged beer came courtesy of a friend, who shared with him a 3-year-old bottle of Duvel. The flavors were so enchanting he leapt to a disastrous conclusion. Slowly, Dawson came to realize that all beers—all wines, too—have an optimal age. Some reach their peak in weeks or even days. Beers suitable for cellaring—and to be fetched from the cellar for a vertical tasting—tend to fall into the 4 “S” categories: strong (at least 8%), smoky, spicy or sour. “There’s really a wide variety” of suitable beers, said Tom Nickel, owner/brewmaster at Nickel Beer in Julian, CA, and owner of O’Brien’s Pub in San Diego. While his tavern always has 28 fresh beers on tap, Nickel also stocks hundreds of bottles, some of which he’s kept for decades. The more potent beers soften with time, becoming sweeter. Sour beers, too, mellow, while certain yeasts common to Belgian beers evolve and deliver flavors reminiscent of dried figs or raisins. A handful of beers are produced primarily for aging. Since 1997, Fuller’s has issued an annual Vintage Ale, each numbered bottle slipped into a crimson cardboard presentation box. Another British brewer, Eldridge Pope, produced Thomas Hardy’s Ale in 1968, 1974, 1975 and then 1977 through 1999. In 2003, O’Hanlon’s revived this classic old ale, issuing it each year through 2008. These collectible beers are bottle-conditioned, microscopic yeast cells in the bottle still working their magic as the beers age. 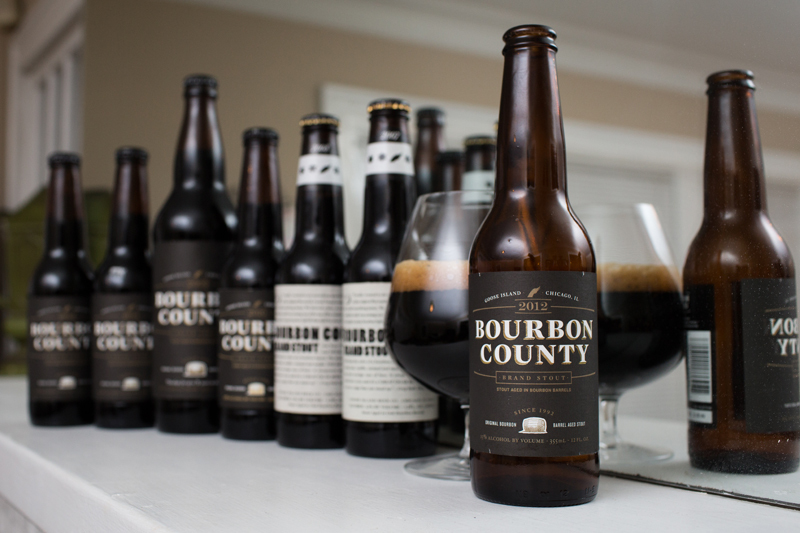 Another oft-cited candidate for aging is Bourbon County Stout (BCS) from Chicago’s Goose Island. Bottled at 13%, it’s a dark beauty with rich chocolate and vanilla flavors, backed by smoky hints of bourbon. Tasting a fresh bottle of BCS, you can imagine how the flavors will blend and become richer in time. That’s part of a vertical tasting’s allure. Opening these bottles, you never quite know what you are about to enjoy—or endure. When aged beers go bad, they exhibit a wide range of unpleasant flavors, everything from vinegar to soggy cardboard. To minimize your chances of gagging on a mouthful of wet paper or cephalopod juice, store beers in a cool, dark place. Dawson prefers capped bottles, noting they maintain a tighter seal than corked or swing-top bottles and thus are better guards against oxidation. When Tom Brown became serious about beer, the veteran wine collector made some space in his wine cellar. He’s determined to protect his ales from heat and light, which are to beer what kryptonite is to Superman. But even with these precautions, time will have its way. In fact, age will produce many changes in a beer’s flavor profile. One chapter in Dawson’s Vintage Beer charts the year-by-year changes in eight cellared ales. He reported that Drie Fonteinen Oude Geuze, a notably tart ale, actually gains sourness for a year before this characteristic tapers off. Yet its barnyard funk qualities, sometimes described as horse blanket or wet hay, immediately decline before plateauing at six years. Medicinal notes in Brooklyn Brewery’s Black Chocolate Stout emerge in its fifth year; the oakiness in Rodenbach Grand Cru slowly increases over a decade; the sherry quality in Sierra Nevada’s Bigfoot, undetectable when this barley wine is fresh, becomes a dominant flavor within five to 10 years. Stone’s Imperial Russian Stout, Nickel said, while changing from year to year, is usually “rough around the edges.” Some time will smooth those sharp angles and accentuate underlying flavors. Nickel mentioned several other boozy beers with rich flavors of vanilla, caramel or bourbon—The Lost Abbey’s Angel’s Share, AleSmith’s Wee Heavy. He also added a wild card: Russian River’s Supplication, an American wild ale brewed with sour cherries. “The axiom is, Don’t age fruit beers,” Nickel acknowledged. But Supplication is an exception to that rule. When it’s released, Supplication has already been aged a year in pinot noir barrels, and dosed with Brettanomyces, Lactobacillus and Pediococcus. “All that sourness and acidity make it a nice one to age,” Nickel said. At O’Brien’s, Nickel has hosted several vertical tastings—a notable one featured 27 Thomas Hardy beers, each of these British old ales representing a different year. These events can serve many purposes. Most are fun. Many are educational. At least one was a rescue mission. In 1997, the Swiss brewery Hürlimann was purchased by a rival, Feldschlösschen. Among the casualties: Samichlaus, a potent (14%) Christmas lager. Hürlimann had brewed it once a year—on Dec. 6, St. Nicholas’ Day—then aged the beer for 11-plus months, releasing it in time for the next year’s Yule. The new owners announced they would discontinue this beer. At the time, the dark and complex Samichlaus was the world’s strongest beer. Perhaps more importantly, it possessed a mighty champion: the British beer writer Michael Jackson. At the 1998 Great American Beer Festival, he rounded up every reporter he could find—a former newspaperman, Jackson understood the power of publicity—and poured them each three thimblefuls of beer, one from each of the most recent vintages of Samichlaus. For many of the scribes, this was their first vertical tasting. And it was a revelation, demonstrating how time could reveal different facets of this lager. The ’97 was thick but bubbly, its maple and black cherry notes ending with a dash of pepper. The ’96 was less effervescent, but rounder, with a warm booziness. The ’95, though, was the group’s favorite. The years had polished and solidified the beer’s character, making this Samichlaus the smoothest of the trio, its sweet, dark fruits offset by a puff of smoke at the finish. Jackson’s dramatic gambit did not pay off—or at least it didn’t at first. But in October 2000, Austria’s Brauerei Schloss Eggenberg revived Samichlaus. 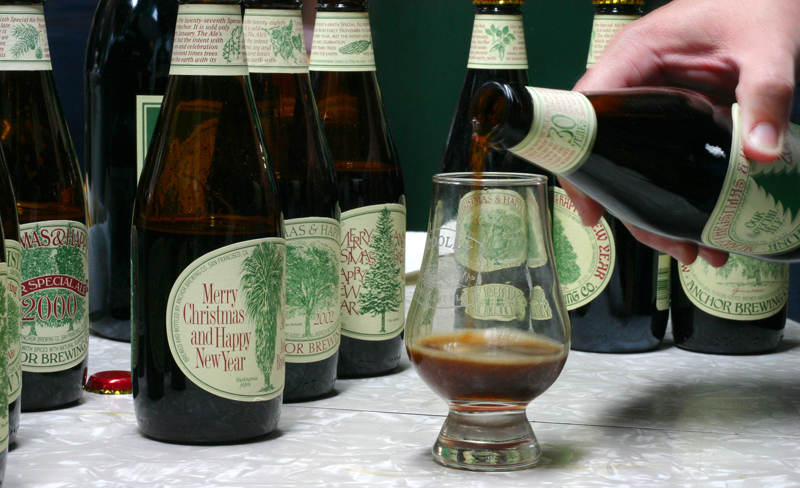 After a four-year absence, this cherished Christmas beer returned to shops and taverns in 2001. If vertical tastings usually aren’t played for such high stakes, many are undertaken for serious purposes. Each year, when the Boston Beer Co. creates a new vintage of Samuel Adams Utopias, the cognaclike ale is blended with previous years’ Utopias, as well as samples taken from barrels of aged Millennium and Triple Bock, earlier strong beers from the brewery. Utopias is usually released at 27%, almost twice as boozy as Samichlaus, which long ago lost its title as world’s strongest beer. These massive ales are naturals for vertical tastings, given alcohol’s role as a natural preservative. Vertical tastings can also help breweries to determine the best time to release an aged beer. Boston Beer’s Barrel Room Collection includes an American kriek that was first brewed in 2009. A vertical tasting of this beer found that the older vintages have a full, ripe cherry flavor, while the latest batch has a juicier quality. He’s also no fan of squid ink. Neither, naturally, is Tom Brown. While the San Diegan’s cellar has what he terms “a very nice” selection of ports, plus extensive holdings in German, Spanish and French wines, he also lavishes care on his growing gallery of collectible beers. He has dark bottles of Samichlaus; at least 10 years of Fuller’s Vintage Ale in their distinctive crimson boxes; bottles of Thomas Hardy’s Ale from the mid-1990s; and his line of Stone’s Old Guardian going back to 1999, that barley wine’s inaugural appearance. 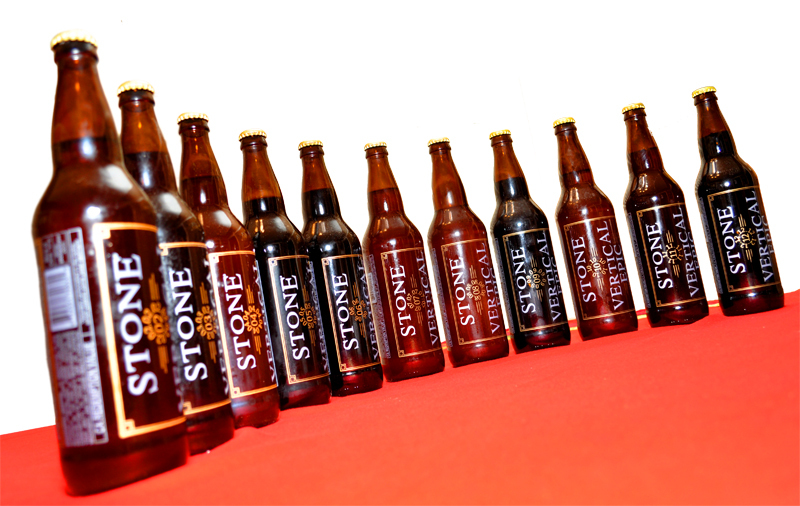 He also has all 11 beers from Stone’s Vertical Epic series. From 2002 through 2012, the Escondido brewery annually released a special brew when day, month and year all matched. That is, 02.02.02 was released Feb. 2, 2002; 03.03.03 on March 3, 2003; and so on until the series concluded with the release of Dec. 12, 2012. Sticklers might complain that the Vertical Epic series is not a true vertical, as each beer has its own ingredients and character. There’s little resemblance between 02.02.02, a witbier with coriander and orange peel, and, say, 12.12.12, a Belgian-style Christmas ale made with Trappist yeast and aged in red wine barrels. Stone, though, has never worried about sticklers. The series was the brainchild of co-founder Greg Koch, noted Stone’s research and small batch director Steve Gonzalez. Each beer would be different, but all would be made with Belgian yeast strains and candi sugar. The series got off to a late start—by the time Stone was ready, the calendar had long ago turned the page on 01.01.01—and so did Tom Brown. Most of the world might have let that slide. Not Brown. By 2012, the former software developer and occasional homebrewer had collected the entire series except for the initial offering. Then he turned to the Internet. On eBay, he snapped up six bottles of 02.02.02. At Stone’s Escondido headquarters, the conclusion of the Vertical Epic series was celebrated with fanfare and a ticketed event. In December 2012, the brewery’s World Bistro & Gardens hosted a $150-a-plate festival, featuring 3-ounce pours of all 11 ales, 11 dishes, plus samples of barrel-aged and cask-conditioned versions. 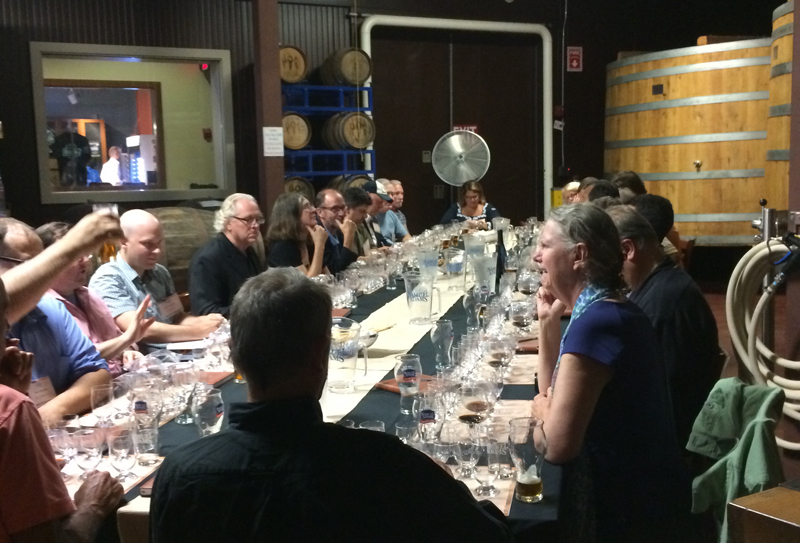 A year later, Brown hosted his own tasting. The guest list included a few wine-collecting pals who were gradually acquiring a taste for fine beer. Stone’s Gonzalez also was there. 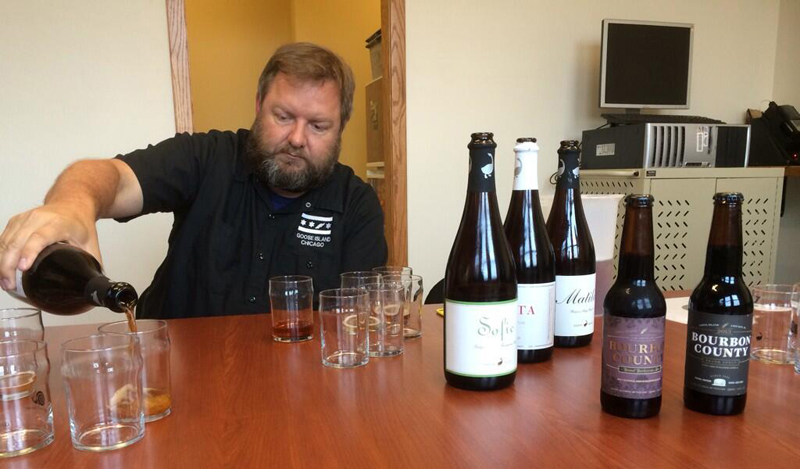 As might be expected from a former software developer, Brown ran a well-organized tasting. Each of the six guests sat down to 12 pint glasses—the extra was for Space Oddity, one of Gonzalez’s experimental beers. Brown measured out samples of each Vertical Epic for each guest; his careful pouring took 10 minutes. Then the group sipped each Vertical Epic in order, greeting the ales with comments, sighs, smiles. The 02.02.02 had distinctive apple cider and pear notes. In the 03.03.03, traces of coriander and Centennial hops had all but vanished, but the peppery grains of paradise helped balance the malts. The next beer disappointed some of the group. “I think ’04 is too light for me,” Susan Brown said. Just about everyone loved 07.07.07 and 08.08.08; the wine enthusiasts applauded the layered complexity of 09.09.09. And so the tasting went, until nearly two hours after the first sip, when 12.12.12 won a mixed review. No matter. With 11 Vertical Epics on the table, plus a few bottles of Space Oddity and Stone IPA, there was something here for everyone. This range of flavors, aromas, textures and mood made the evening so appealing and interesting (read more tasting notes here). 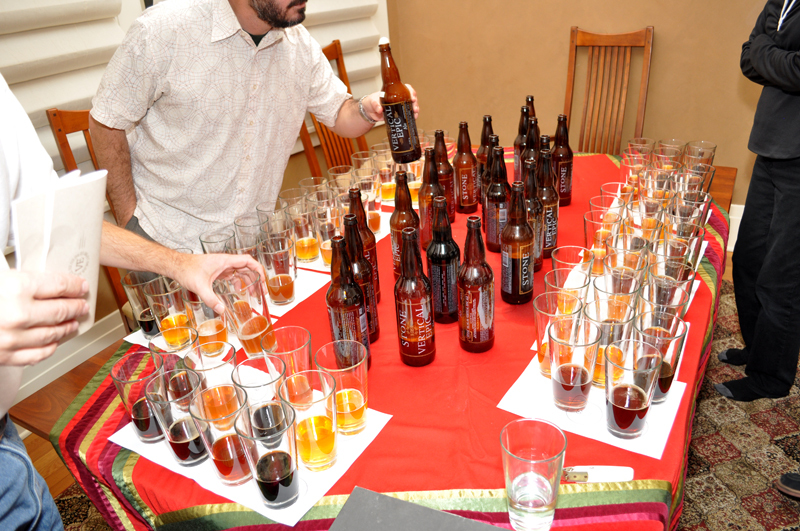 Vertical tastings are a great excuse to enjoy a lot of beer at one session, and a great way to show off a collection. And collecting is its own excuse—as any collector will tell you. Need? Probably not. But anyone who has a dozen vintages of that Sierra Nevada barley wine has the ingredients of a great vertical tasting. MORE: See a list of the 25 best beers for collecting and read notes on vertical tastings of Bigfoot Barleywine Style Ale, Sexual Chocolate, Fade to Black and Alaskan Smoked Porter. Peter Rowe is a reporter and columnist for U-T San Diego. Follow him on Twitter @peterroweut.